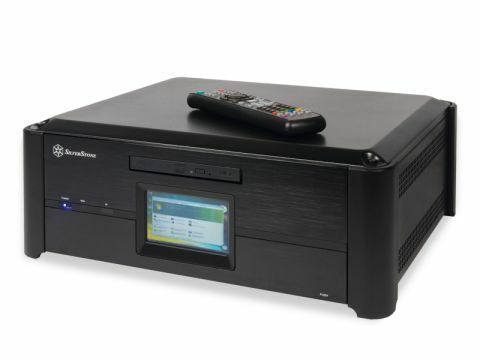 If you want a well-endowed home cinema PC but not the hassle of putting it together yourself it's hard to go wrong with this one. But the Hauppauge tuners deserve better software. DVB Viewer is recommended and a decent aerial installation is essential for reliable Freeview reception. When you can buy a desktop computer for £300, you should expect a machine that sells for more than five times that amount to be very special. And indeed your money buys a machine packed to the gunwales with high-tech hardware. Its surprisingly compact Silverstone Grandia GD02-MT case has a built-in 4.3in touchscreen LCD monitor that is driven from the passively cooled ATI Radeon HD4670 graphics card's secondary output. The screen is used exclusively with an application known as iMon, which allows various features (including applications, volume/ equalisation and media playback) to be launched or controlled via the touch-screen or a remote handset. In addition to scrolling newsfeeds and weather, the panel can also display video. The Radeon card's main output is HDMI and, thanks to its display drivers, it will easily feed full-HD video (1920x1080p) and digital audio to a compatible display. That said, although it does a lot for the money the HD4670 isn't the most powerful graphics card around – gamers might want to specify something else when ordering this system – but what's offered takes SD and HD video in its stride. Processing power is also important, and this system doesn't disappoint here either. Its Biostar TF-7150U-M7 motherboard harbours an Intel Core 2 Quad Q9400 processor, aided by no less than 4GB of memory. An onboard soundcard supports 7.1 analogue, but lacks a digital audio input. The motherboard's own GeForce 7150 graphics capabilities are unused, but its Gigabit Ethernet port is available. Onboard SATA-interfaced storage is of considerable interest; a notebook-style 'slide-out' optical drive provides CD/DVD read/write and Blu-ray playback, while the hard drive is 1TB in size. Yoyotech has also provided a 60GB (solid state drive) – an expensive item that accounts for a fair slice of the machine's asking price. Its main advantage is incredible speed relative to electromechanical hard drives. For this reason the drive has been provided primarily to store the operating system so that boot-up times are minimised. On which subject, the review system was pre-installed with Vista Ultimate Home 64-bit. Alternatives can, however, be specified. For digital TV you get a pair of Hauppauge HVR-4000 cards that combine DVB-S/S2, DVB-T and analogue reception. Having two cards means that you can watch one programme while recording another carried via a different transponder. Hauppauge's own digital TV application is supplied, but alternatives can be used (we used DVBViewer and TSReader too). To ensure enough power, even with two LNBs connected, a 500W CoolerMaster power supply is fitted. The system worked very well, even with full-screen 1920 x 1080p playback of BBC HD, the total CPU load amounted to a mere 10 per cent. It also ran quietly. But there are criticisms. The DVB-T tuners of the Hauppauge cards are horrendously insensitive, although satellite reception is fine. The only non-HDMI digital audio output is on the motherboard – it hasn't been brought out to a connector. And both of the motherboard's PCI slots are occupied leaving no room for expansion, so you're restricted to USB (2.0) devices. Happily, there are six ports (two are under a front-panel flap, alongside an unused FireWire port).